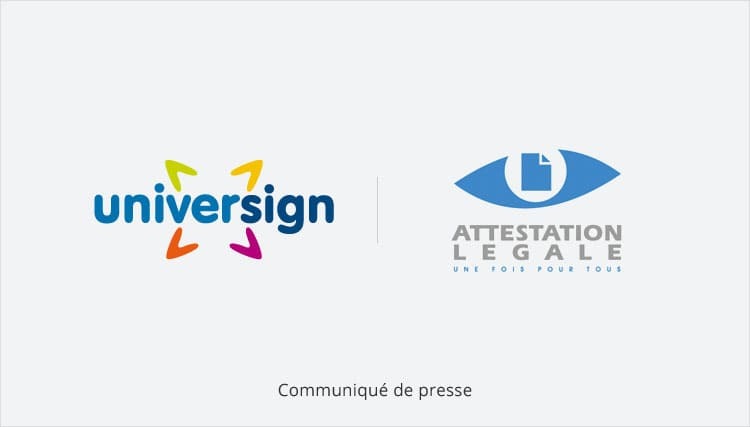 ALG, the publisher of the Legal Attestation Platform (www.attestationlegale.fr), offers its clients an electronic signature service at the heart of its platform for collecting and authenticating administrative documents of co-contractors. Since January 2015, the company has successfully used the Universign platform and announced an evolution of its trusted services in partnership with Universign. The legal attestation platform (www.attestationlegale.fr) is a collection and authentication service for the administrative documents of the co-contractors, initially for the construction and real estate sector and, today, diversified in many sectors. The company acts as a ” Third Party of Specialized Trust “. From 3 000 to 8 000 customers within a year ALG manages the administrative file of each client company and secures its distribution to all public and private clients. ALG aims at facilitating relations between the various actors (contractors and suppliers) by simplified and confidential management of the documents, by creating a single and complete centralized administrative file and then sharing it online via the Platform Legal Statement. Since January 2015, Universign has been assisting Legal Statement in its challenges of digital trust and dissemination of documents with legal value, through its electronic signature solution, in this context of strong growth. The electronic signature has existed on attestationlegale.fr since 2010 and it is at the occasion of a renewal of provider that ALG has called Universign. More than a customer-supplier relationship, it is a true meeting between an innovative company of the French Tech, labeled “Pass FrenchTech 2015” and a leading player and major of the electronic signature in France, both engines of digital confidence. “Reactivity, availability, direct answers to our expectations … We appreciate our collaboration with Universign teams. We find in Universign a lot of our own values: the logic of good “caring” our customers and bringing the maximum solution to the needs expressed.” Said Jean-Louis Brunet. In 2016, it will be necessary to follow this synergy for more Digital Confidence. Universign is the cloud platform for digital signature, timestamping and digital identity management for Cryptolog. For more than 15 years, Cryptolog has been a trusted player of digital trust. Universign’s vocation is to facilitate secure and efficient digital exchanges. Attestation Légale proposes a web platform, originally to the professionals of the BTP and today for other sectors (transport, temporary work companies …), in order to lighten the administrative tasks that stem from these obligations. In 2015, ALG received the “Pépites 2015 de la coirssance” label and, since the end of 2015, has been part of the “Pass French Tech” which accompanies hyper-growth companies. All the news and Universign of Digital Confidence. Subscribe !